At the end of the Victorian era, science and technology are rapidly changing life in Europe. Electric lamps illuminate city streets even in the darkest night. Trains and steamboats are making travel faster and less expensive than ever before. Telegraphs and even telephones enable communication across vast distances. Typewriters and phonographs enable people to quickly record and organize information—or even just share their thoughts. Yet terrible, centuries-old evils also have access to these innovations, and the most diabolical of them all has awakened once again. 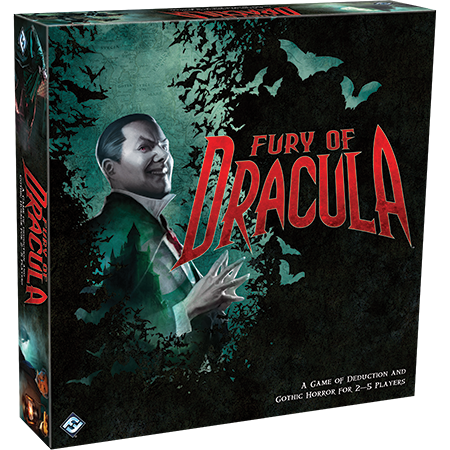 In Fury of Dracula you and your friends must work together, using any means necessary to thwart the Count before he attains more power than ever before. Thankfully, the four brave souls pursuing Dracula are no ordinary mortals, but possess unique qualities that equip them for their dark quest. 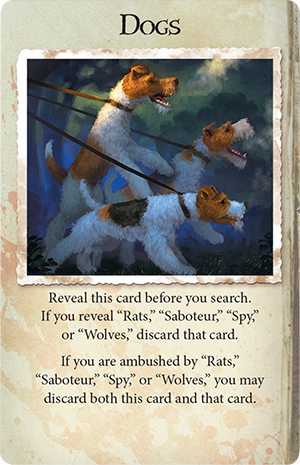 Today’s preview introduces you to the hunters of Fury of Dracula and the abilities that enable them, together, to stand up against the greatest vampire of all time. Eight years ago, Lord Arthur Godalming lost his father and his fiancee, Lucy Westenra within the space of a few weeks. His father left Arthur a sizeable fortune. Lucy, however, died as one of Dracula’s victims, leaving Arthur only memories and a determination to eradicate such evil from the face of the earth. Now he pours all his strength, bravery, and money into the hunt for Dracula. 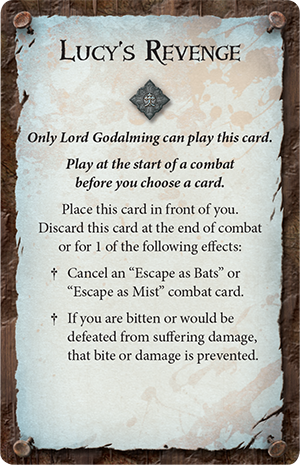 Lord Godalming’s wealth allows him the unique ability to obtain two items with every supply action, allowing him to not only to arm himself easily, but acquire holy bullets, crucifixes, and even hunting dogs for the team. Not only is he wealthy, but Lord Arthur Godalming is also a member of the English nobility and can use that privilege to travel easily. Whenever he reserves a train ticket, he takes two instead of one, and can provide those tickets to other hunters. Yet Lucy is never far from his mind and her memory still strengthens him. It can even prevent him from being bitten and save him from death. Arthur Godalming and John Seward were friends long before the former had a title, the latter had a degree, and either believed in vampires. John Seward has always been interested in the unexplained and uncanny, and so once he became a physician, he took up a position at an insane asylum. He also asked for Lucy Westenra’s hand in marriage, but never begrudged Arthur victory in that contest. 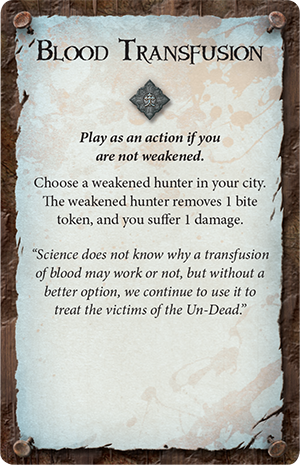 As a physician, Dr. Seward helps his companions heal: a hunter in the same city as him recovers two points of damage from resting, instead of just one. Years of practicing medicine have also taught him to always be prepared: he can carry with him one item and event card more than the other hunters. He also may carry with him the wax cylinders that contain voice recordings of thoughts. 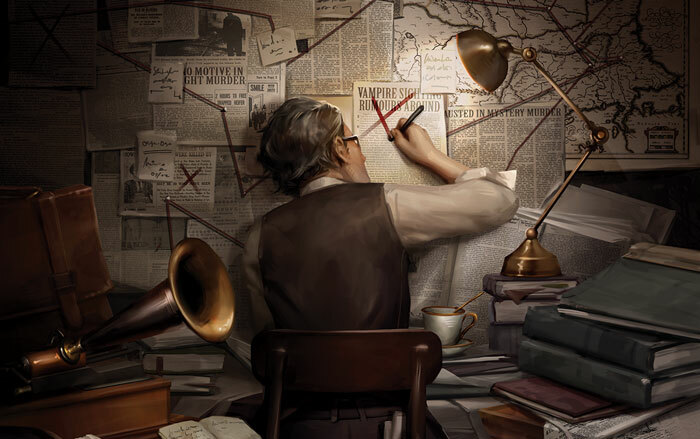 They help him to analyze his situation and make careful deductions about where Dracula might be and what the vampire might be up to. The Dutch scholar Abraham Van Helsing has dedicated his life to studying obscure and legendary diseases. He was the first to recognize the red marks on Lucy Westenra’s throat for what they were, and the first to understand the massive threat Dracula’s arrival in England posed. His mystic research allows him to anticipate and undermine Dracula’s plans. Dr. Van Helsing is as tough and fearless as he is knowledgeable. 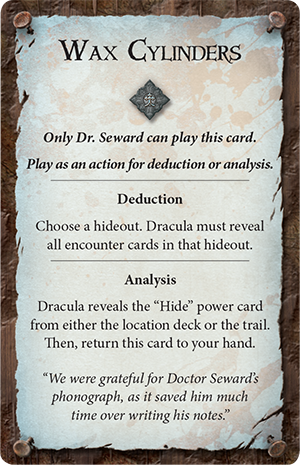 Lord Godalming and John Seward can only survive one bite from Dracula’s fangs, but Dr. Van Helsing can continue the quest with two vampire bites weakening him. He is also a natural leader, and looks out for the rest of the team: Van Helsing alone can trade event cards with other hunters across any distance, perhaps forwarding a telegraph from Galway to Galatz, or sending a blood transfusion from Athens to Berlin. 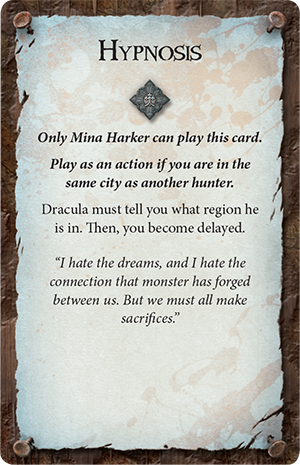 Mina Harker was at the center of Dracula’s machinations eight years ago. Lucy was her best friend. Her fiance at the time, Jonathan Harker, was imprisoned for months in Castle Dracula and nearly died. Her typewritten records of Lucy’s experience, her copies of Jonathan’s correspondence, and her shrewd logic were essential in driving the Count out of England—but not before Dracula managed to attack her repeatedly. The bite scar still lingers on her neck and still connects her psychically to the Count. She begins the game weakened, so that another bite would kill her. Dracula is also aware of one item and event she possesses, as he is with any bite victim. Mina’s psychic bond with Dracula can be used against him. 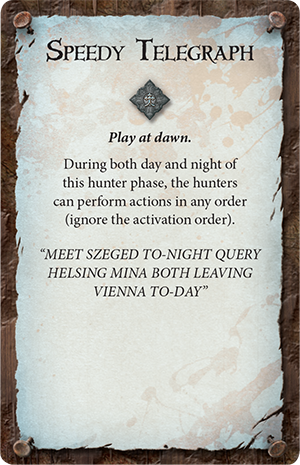 If she is in the same city as another hunter, she can force the Count to reveal whether or not he is in the same region. She may also choose to become delayed to undergo hypnosis and experience waking dreams, through which she can inform the other hunters which region Dracula occupies. The fact that she has been drained, however, does not stop Mina from hunting Dracula or even fighting him. She is no less brave than the other hunters—perhaps even braver—and determined not to become an idle, unavenged victim. Against a foe such as Dracula, a psychic bond can be as useful as a telegram. A crucifix as useful as a pistol. Knowledge of dark and arcane myths is as useful as fast horses, hunting dogs, and plentiful wealth. In Fury of Dracula, technology is a powerful weapon, but your enemy is a fiendish master of incredible, supernatural, unexplainable forces. You will have to believe in and master such forces as well if you want to defeat him. The darkness is spreading. 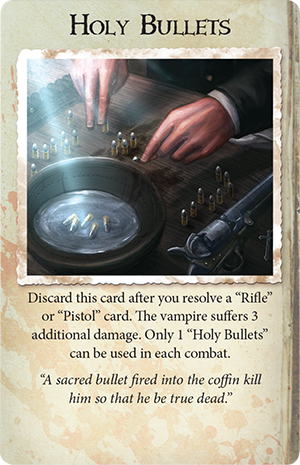 Pre-order Fury of Dracula from your local retailer today. 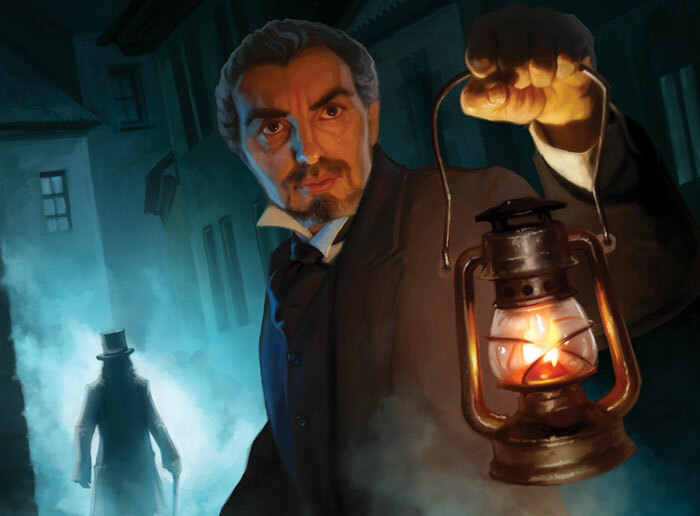 Fury of Dracula is an asymmetrical game of deduction and Gothic horror set in Victorian-era Europe. 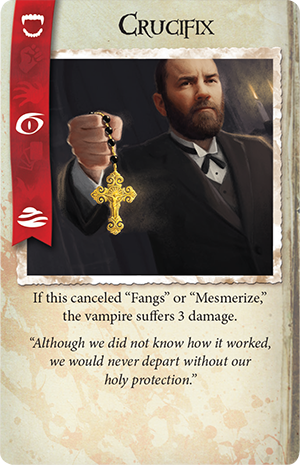 One to four players govern iconic characters from Bram Stoker’s classic novel as they pursue the King of the Un-Dead, while another player assumes the role of Dracula himself as he strives to plunge the entire continent into a vampiric darkness. Fury of Dracula © Copyright Games Workshop Limited 2015. Fury of Dracula, the Fury of Dracula logo, GW, Games Workshop, and all associated logos, illustrations, images, names, creatures, races, vehicles, locations, weapons, characters, and the distinctive likeness thereof, are either ® or TM, and/or © Games Workshop Limited, variably registered around the world, and used under license.